Presidential historian Michael Beschloss sends out some great stuff on Twitter (@beschlossDC). 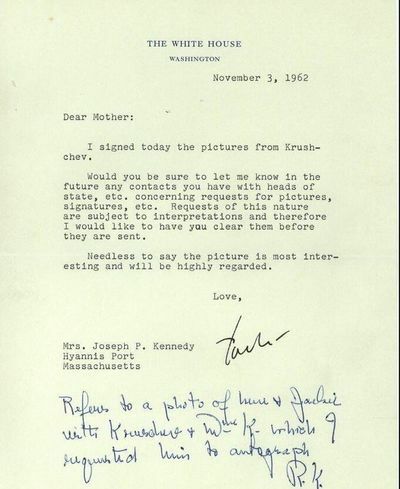 On Mother's Day, he tweeted this image of a letter from JFK to his mom, dated November 3, 1962. In it, the President tells his mother he has signed the copies of a photo he received from Soviet Premier Nikita Khrushchev, which Khruschchev apparently had previously autographed at the request of Mrs. Kennedy. He makes sure to tell her that he thinks the picture "is most interesting and will be highly regarded." He does also mention that, since he is the President, it might be best if in the future she would check with him before contacting any other heads of state directly. Contacts by the President's mother "are subject to interpretations," he suggests, "and therefore I would like to have you clear them before they are sent." This was first posted about a week ago by the JFK Library, and as they noted, this letter was written less than a week after the end of the Cuban Missile Crisis (in fact, the blockade of Cuba was still in effect at the time). They didn't say when Rose Kennedy had written to Mr. Khrushchev to begin with, and presumably it was well before the crisis started on October 14, but regardless it is highly amusing to imagine the President learning about this and then (probably after a facepalm) trying to figure out exactly what to say to Mother in this letter. According to the JFK Library's post, she wrote back and said she understood and that it just hadn't crossed her mind that this might be a problem. More evidence that even after you are all grown up and become the President or whatever, your mom will always be your mom.